I carry my phone with me all the time! So I live just a couple of minutes north of Pewaukee Lake, one of Wisconsin‘s largest. On the east shore there is always something going on. Many times I’ll sit with the family when we get ice cream. They’re looking at the sunset while I’m looking at the road. 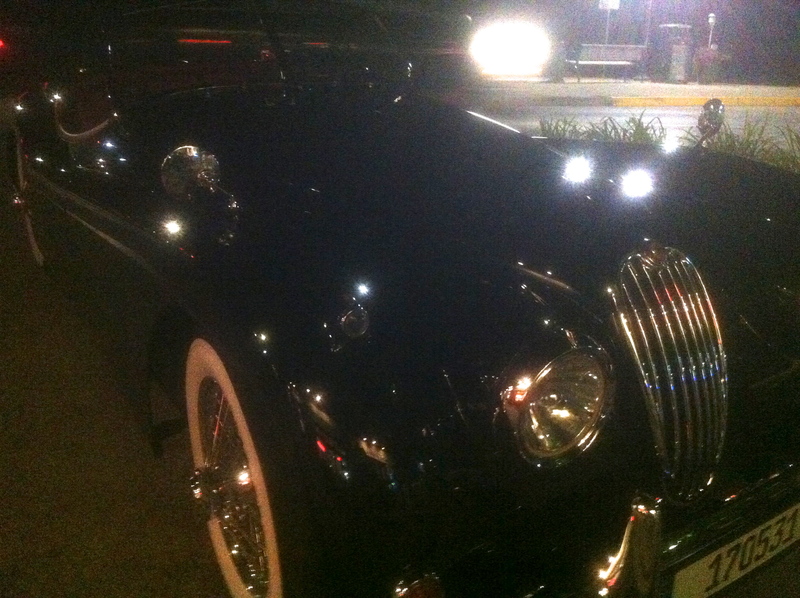 So one night we come out of the ice cream shop and what parks right in front of me but this 1961 Jaguar XK-150 convertible. Sorry for the darkness of the images. This model represents the ultimate development of the XK-series cars prior to the advent of the XK-E. Three SU carburetors feed the 3.8-liter engine with valve actuation by dual overhead camshafts and a Weslake-developed ‘gold’ cylinder head. It is virtually identical in all specifications to the XK-E powerplant. The 150S offered the owner/driver the combination of sparkling performance and handling blended with a level of comfort and luxury rarely encountered in thoroughbred sports cars of this period. 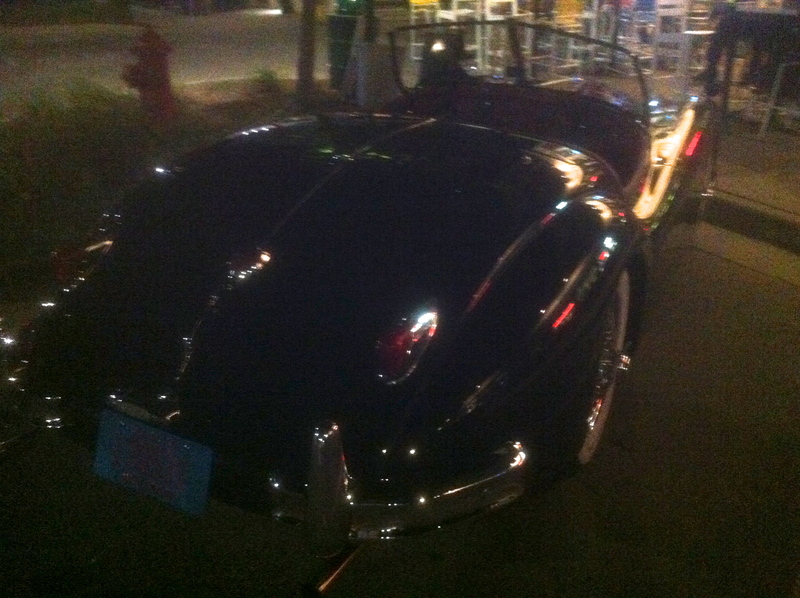 This is owned by the same guy who owns this Kaiser Darrin. Only made them one year. 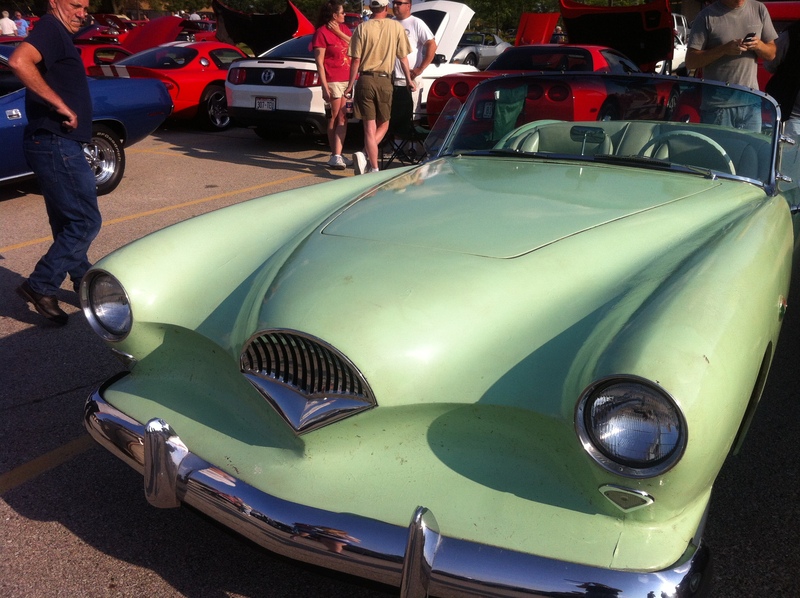 Fiberglass body and the doors slide it. He is going to keep it un-restored just like you see it here. He also has a Tucker. That’s one heck of a collection. A check with Hemmings and I found alot of Jags that were daily drivers, most in mid five figures but the really good one’s were bumping up to 200K. This car is in that class. This was really sad. There are collectors that would love to have a vintage Thunderbird but not this 64-ish. I mean what was the guy thinking? He had if for sale and last time I rode by it was still there. Go figure.